Observed on seven continents, even the International Space Station says "Aarrr"
Humorist Dave Barry credits day for furthering "international misunderstanding"
(CNN) -- Easy tip number one, if you want to talk like a pirate: Add "me hearties" to the end of any sentence. 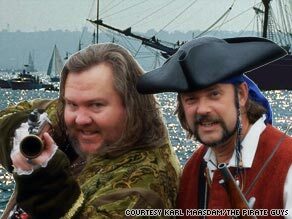 Mark Summers, aka Cap'n Slappy, left, and John Baur, known as Ol' Chumbucket, created Talk Like a Pirate Day. The meaning is simple -- "my friends, my mates" -- said John "Ol' Chumbucket" Baur, before offering as way of example, "Turn your head and cough, me hearties. Or, fill it up with regular, me hearties." Saturday marks "Talk Like a Pirate Day," an observance that has been recognized on all seven continents and beyond. It inspires dress and behavior -- of the Long John Silver variety -- in seedy bars, staid workplaces and even the International Space Station. It has fueled fundraisers, been the topic for a New York Times crossword puzzle and mentioned on various game shows. "We just grew up in a time and place where we saw the wrong movies, read the wrong books," Baur said from his current home in St. Croix, Virgin Islands. Putting their deep-thinking noggins together, the two decided the world needed in on this, too. Avast -- Stand and give attention; listen up. Aye -- I heartily agree with everything you said or did. Aye Aye -- Yeah, boss, I'll get on that as soon as I finish this coffee or rum. Aarrr -- Not to be confused with Arrgh (a sign of pain), it's a way of announcing yourself to the world, telling everyone you're here and alive. It could mean don't look at my girlfriend that way, or I'm enjoying this hamburger. They selected September 19, simply because Summers had recently divorced, it was his ex-wife's birthday, and he figured "the date was stuck in my head, and I wasn't going to do anything with it anymore." Now Ol' Chumbucket and Cap'n Slappy have a full-fledged movement, with a Web site that gets millions of hits -- one September they got 19 million hits, Baur said -- and books such as, "Pirattitude: So You Want to Be a Pirate? Here's How!" and "The Pirate Life: Unleashing Your Inner Buccaneer." They offer T-shirts, have performed in Las Vegas, Nevada, and made appearances across the country. Ol' Chumbucket's family even appeared on a piracy blown-out-of-proportion episode of ABC's "Wife Swap," which the man otherwise known as Baur, a reporter and editor for a St. Croix news service, said he's never had the stomach to watch. Summers, a licensed clinical social worker who works with troubled kids, brings his altruistic spirit to the pirate world as well. "Ask Cap'n Slappy" is an advice column, featured on the pirate duo's Web site, that he started to help people help themselves -- in ways he wouldn't dare propose while wearing his professional "Behavior Consultant" hat. "If Ann Landers was a drunk and flagellant pirate," that's what you'd have, said Summers, who still lives in Albany, Oregon. "Most of my solutions involve a savage beating with one's fists or forehead." "This is not what my parents would have chosen for me, but when the wave comes up, you ride it," Baur said. "We do it for fun. We don't pretend that this is serious." Summers said his mother, Lois, sometimes slips and calls him "Slappy," even though she doesn't really get what this is all about. When the Dave Barry column came out, he said her comment to him in a phone call was typical mom: "I don't know what's so funny about talking like a pirate, but I love you anyway." The waters have been rocky at times for the two. Those darned, much-publicized Somali pirates, including those who in April took Capt. Richard Phillips hostage (before he was rescued by U.S. Navy SEAL snipers), threaten to give pirates like Cap'n Slappy and Ol' Chumbucket a bad name. "I wrote an article for Pirates Magazine. Yes, there is a Pirates Magazine," Cap'n Slappy said. It was "an open letter to the Somali pirates. I said the AK-47 is a vulgar firearm. If they want to be remembered for something, they're going to have to switch to the blunderbuss [picture Elmer Fudd's weapon]." Barry reflected on the pirate-talking cause in an e-mail Thursday, saying, "I am extremely proud of my role in helping to promote International Talk Like a Pirate Day, which I believe has done more than any other single day to further the cause of international misunderstanding." But Ol' Chumbucket and Cap'n Slappy would like to think their contribution to society has yet to see its full potential. Imagine if Israelis and Palestinians, for example, took time out to share this language and some laughter. "Twenty years from now?" said Cap'n Slappy. "Nobel Peace Prize."